Braintree, MA (December 8, 2017) – Peabody Properties announces that Zelma Lacey House, an assisted living community in Charlestown, Massachusetts, has been selected by the University of Maryland School of Nursing and Penn State University to participate in the study of an innovative program and philosophy of assisted living care. 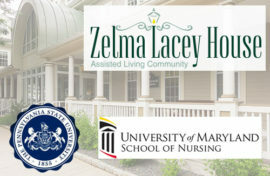 Zelma Lacey House is just one of ten assisted living communities in Massachusetts chosen for the year-long study, titled “Function Focused Care.” The program is designed to teach staff how to integrate physical activity into the daily lives of residents; previous research has shown that this approach can improve the physical ability of residents, thereby decreasing falls and hospital admissions. Statistics indicate that more than 50% of seniors fall annually at age 80 with falls resulting in 25% of hospital admissions and 40% of nursing home admissions. The study is made possible through a grant from the National Institutes of Health.